Can a fat sea duck bring young people together? The California Young Birders Club birds on a levee at Modesto Wastewater Treatment Plant. At Pebble Beach near Monterrey, a young group of people are not playing golf, but rather looking for a bird. “We are looking for a Common Eider, which is a fat Sea Duck that usually lives in Alaska,” explained Joachim Gonzalez, a freshman at Academy High School in San Francisco and a member of the California Young Birders Club (CAYBC). Seeing birds like our wayward Common Eider is what this young group of people are basically all about. “It’s about seeing birds… and it’s pretty hecking fun,” Gonzalez stated. The club was founded in 2014 by Elisa Yang of San Diego. Jonah Benningfield of San Francisco then decided to build on the success and start a Northern California chapter. 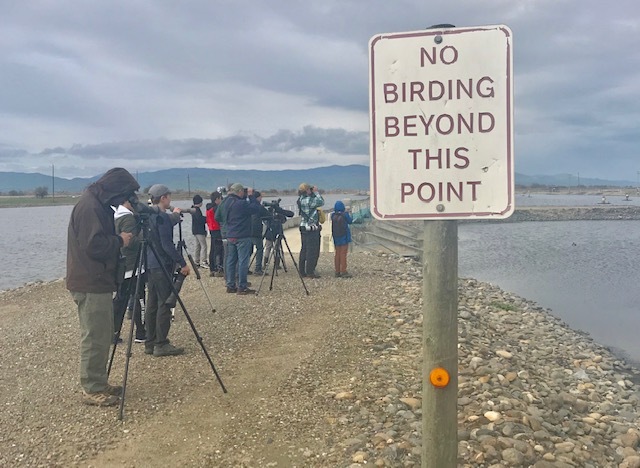 Now, the California Young Birders club boasts a membership of about 25 kids from all over the Bay Area, each with one simple connection. “We all like birds. That’s what brings us together,” club member Dominik von Briel pointed out. That’s my brother, who is also a birder. Now, while one may have heard of birdwatching, the term that would best describe what the teens in the club do is birding. Think of it like Pokemon Go, but in real life, with people chasing birds rather than animated cartoon characters. Like in the app, though, some birds are harder to get than others. This can make it very competitive at times. “It took me six years to find lifer Glaucous Gull,” Lucas Cornelissen described. What club member Lucas Cornelissen of Novato brings up is the competitive part. Listing. Think of it like the Pokedex of our Pokemon Go analogy. This listing process can be done in many ways. It used to be done on paper, but now, people use Ebird. Ebird is a site created by Cornell University and the National Audubon Society in 2002. Birders can send in checklists of birds they see, which Ebird then compiles into hotspots and lists. In return, checklists can be used to track different bird populations across the country. “You could say it’s a win-win, you know?” Von Briel added. In the end though, back at Pebble Beach, all of them, from the listers and regular birders alike, are happy when the Eider first appears behind a rock at the Pebble Beach stakeout site.